Read about the challenges, humor, and rewards of teaching, as well as classroom tragedies and successes, that take place in inner city public schools. These 50 vignettes describe human-interest, middle school events. For example, have you ever feared for your life? Have you ever been accused of something that was not your fault? Have you ever had a conversation with someone and they suddenly say something disrespectful? These scenarios emerge from real-life situations experienced by two Los Angeles middle school teachers. 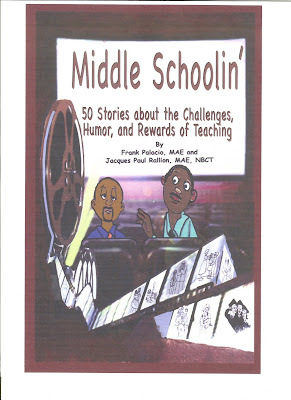 In Middle Schoolin’, authors Frank Palacio and Jacques (pronounced zhäk) Rallion share fifty vignettes garnered from their collective years working with teenage students. Based on interactions with students, parents, and other education professionals, the stories both educate and entertain and include anecdotes that are humorous, sad, tragic, hopeful, uplifting, and thought-provoking. The vignettes reveal the day-to-day challenges that teacher’s face and the rewards that are often bestowed as a result. From the knife-toting male to the watch-swiping student, and to the late-to-class-again girls, this collection provides a glimpse into the modern-day classroom. Addressing valuable moments in teaching, Middle Schoolin’ opens the classroom doors to provide an insight into the human element of education. It reinforces the idea that education can transform lives and that today’s youth are the world’s greatest resource. This book can be purchased at www.amazon.com, www.bn.com, and also at Angulus Press locations in Belize. Hello Linda, Thank you for bringing to us information and news about Crooked Tree and Belize. I really enjoy your blog, it's fun and keeps my attention, oh and I love your music selection too. I will try to order this book and will encourage my friends from Belize to do so too. Thanks again for keeping us informed on our Belizean community at home and abroad. You are doing an awesome job, Linda! I am very proud of you. Keep up the great work! You get a 5 thumbs-up from me.